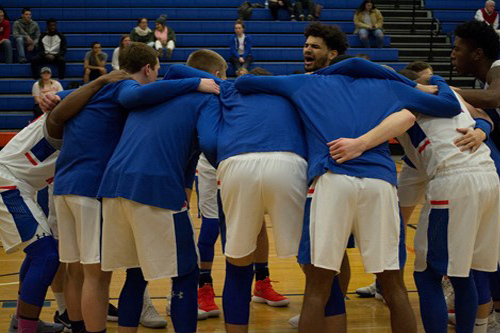 The New Paltz men’s basketball team will be heading into their first State University of New York Athletic Conference (SUNYAC) matchup with a winning record, totaling 2-1 on the year thus far. Before heading home for Thanksgiving, the Hawks picked a pair of wins in their home opener against SUNY Maritime College and last Tuesday against SUNY Delhi. On Friday, Nov. 16 the Hawks did not hold back against the Privateers and earned a 77-73 victory, their first of the year. Maritime managed to tie the game twice, once at 23 in the first half and once at 69 with just over three minutes to play. But, New Paltz never allowed them to take the lead. The Hawks led by as many as 14, until about 12 minutes through the first half when a 3-pointer by third-year guard Michael Walker tied the score at 23. First-year guard Dylan Fraser came off the bench and answered with back-to-back threes ensuing a 21-7 run for the Hawks setting the score to 44-30 at the half. Maritime switched to a defensive zone, causing the Hawks to settle for shots from the field and later went on a 23-8 run and hung around until the score was tied at 69. The Hawks hung on to the victory though, with fourth-year captain Cory Garcia sinking 3-of-4 from the free throw line in the final seconds of the contest. Wissemann led the charge for the Hawks with 17 points, four rebounds and four assists. Second-year guard Jake Passeretti followed with 11 points and five assists while third-year forward Scott Reisert tossed in 10 points and six rebounds. Fourth-year captain Paddy Parr also grabbed 10 boards and tossed in three assists and two points for the Hawks. Against SUNY Delhi, New Paltz was able to maintain a 10-point cushion for most of the half, but allowed the Broncos more second-chance points (14-6) and points off turnovers (8-2). The Hawks outshot the Broncos (52.94 percent to 30.23 percent) and shot 63.64 percent compared to 21.74 percent from beyond the arc and went into halftime with a 45-39 advantage. Garcia began a seven-point run for the Hawks with a trey a minute into the second half. The Broncos battled back though and brought the score as close as four in the final minute of the game. Garcia, however, came in clutch at the line again sealing the 89-84 victory. Reisert led the Hawks with 22 points and Passeretti tossed in seven assists. Garcia and Wissemann finished the game with 15 and 11 points, respectively. The Hawks open up conference play on the road this weekend at Plattsburgh State and SUNY Potsdam on Friday at 7:30 p.m. and Saturday at 4 p.m. Reisert said that the team is excited to shock the conference.